On Saturday 1st March, as part of a National Day of Action targeting Sainsbury’s supermarkets, Brighton & Hove PSC members handed out leaflets at the Sainsbury’s store in New England Street. The response from the public was, as usual, fantastic: shoppers were appalled to learn that, despite the company’s attractive ethical trading policy, it continues to trade with companies operating out of illegal Israeli settlements in occupied Palestine. Many of them promised to complain to the manager of the local store, and to write to the company’s head office. Sainsbury’s uses suppliers that trade in products from illegal Israeli settlements. Israeli settlements are built on stolen Palestinian land and are illegal under international law. 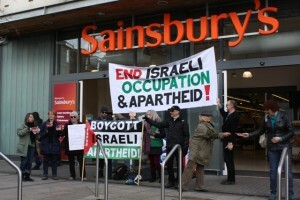 Up and down the country on the 1st of March, people of conscience picketed their local Sainsbury’s storecustomers that the company’s ethical trading policies are meaningless so long as they continue to trade with the illegal Israeli settlements in the occupied Palestinian territories. I’m supporting this important campaign because the occupation of Palestine is illegal, and is an abuse of fundamental human rights. Companies that operate in and export from illegal settlements profit directly from these violations. Supermarkets who provide business to these companies therefore become complicit in these violations. Supermarkets rely on the trust of their customers, and I believe that the continued support for economic activities in the illegal settlements threatens the reputation that supermarkets so strongly rely on. I therefore urge Supermarkets such as Sainsbury’s to face up to this and end all further support of these activities.